June 2, 2006 – Design Research. Experience. life. 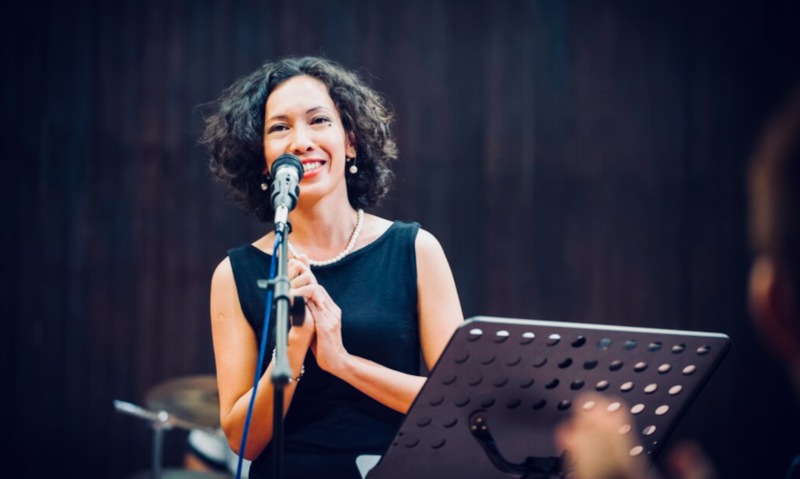 Malaysia’s gastronomic heritage has drawn from each of the constituent cultures of Malaysia as well as from neighbouring states to produce what many people consider to be the most delicious cuisine in the entire world. The internationally-renowned cuisine of China’s Canton and that of southern India are significant sources of Malaysia’s culinary heritage, physiotherapy as is the sublime cuisine of Thailand. Fresh tropical fruits and succulent Malaysian seafood are featured ingredients, click and the chilies and curries of India and Thailand form the basis of spicy preparations. Coconut milk is ubiquitous in Malaysia, imparting a delicious smoothness to curries and other dishes. The mainstay of every Malaysian meal is rice. At each meal, a generous helping accompanies a selection of dishes, including fish, seafood, vegetables, and poultry. Beef is conspicuously absent, as it is across much of Asia. Individual recipes vary widely from state to state. Basic ingredients may be the same, but the method of cooking and accompanying dishes changes with each state’s own tastes and special produce. 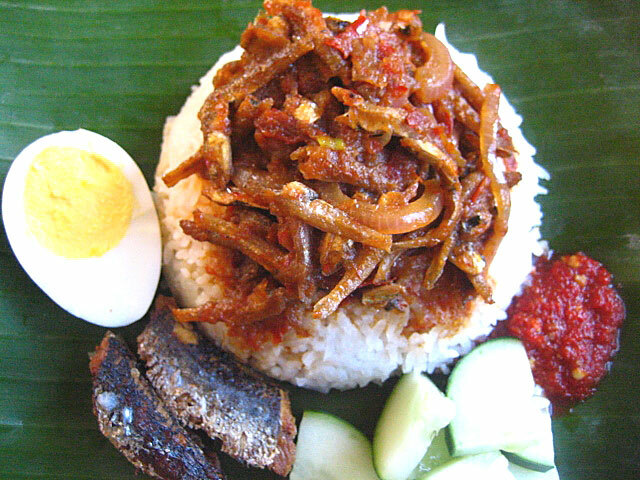 The perennial Malaysian favorite nasi lemak is completely different in Kedah, for example, than that tasted in Johor or Selangor. One has to savor both to truly appreciate the diversity of preparation. Breakfast is a major meal of the day, not a neglected snack. Dine on fragrant nasi kandar, fish curry served with meat in chili sauce and boiled eggs. Or try the nasi dagang, glutinous rice cooked in coconut milk, served with fish curry, coconut sambal, and cucumber pickle. Excellent and inexpensive food can be obtained virtually anywhere in Malaysia, largely because of the strength and ubiquity of food stalls. Whether it be in villages, small towns, or big cities, visitors can find stalls offering mouth-watering treats. 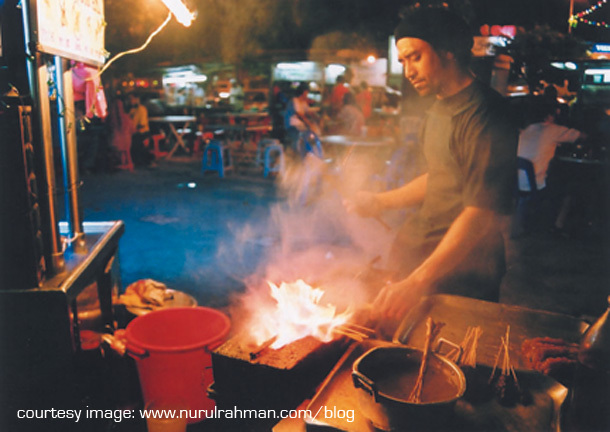 Dining at a cart or streetside stand may sound plain and piecemeal, but in Malaysia eating food at the roadside stalls is a much-loved practice. The best stalls are as popular and as crowded as any permanent restaurant–VWs and BMWs are equally likely to be parked close by, and their owners rubbing shoulders in the long line. Some stalls are open from morning to evening, while others are open from evening to dawn. Others are open around the clock, seven days a week. 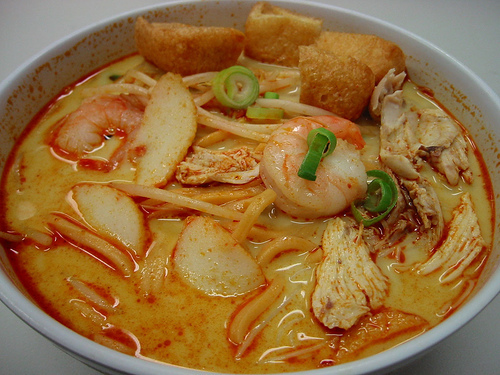 Here is a small sampling of Malaysian cuisine; many of these dishes are available at stalls. The stalls will come to you; if you see something that looks good, chances are it is. And you may not see that particular stall again for the rest of your stay–seize the day. A rice dish cooked in coconut milk. It is served with ikan bilis (anchovies), sambal, boiled egg, fried peanuts and cucumber slices. This is also a popular breakfast dish. Can you imagine yourselves having this heavy breakfast? 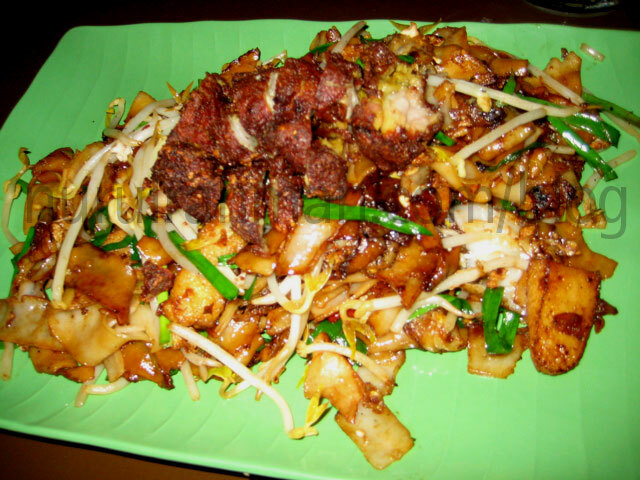 The most popular dish of Malaysia. Bite-sized pieces of beef, mutton or chicken are marinated in spices, then skewered through thin bamboo strips, and barbecued over charcoal fire. Satay is served with ‘ketupat’ (rice cake) and a raw salad of cucumber, pineapple, and onions. Sweet, spicy peanut sauce accompanies the dish. This image was taken in 2001, Gurney Food Court, Penang, Malaysia. This ‘satay’ is the best ‘satay’ dish I ever had. The all-time breakfast favorite of Malaysians. Made from wheat-flour dough, roti canai sometimes incorporates beaten egg and diced onions for a crispier pancake. A popular breakfast dish in the country provinces of Kelantan and Trengganu. Brastari rice and fish curry are the simple but delicious elements of this dish. A complete dish in itself with bits of meat, prawns, egg and vegetables. A salad of pineapple, cucumber, bean curd, prawn fritters and boiled egg, is served with peanut sauce. Flat rice noodles stir-fried with minced garlic, fresh prawns, bean sprouts, cockles and eggs, seasoned with soy sauce and chili paste. There are several variations of chicken rice, but the most popular is the Hainanese version. The chicken is served with rice which has been cooked in chicken stock. Garlic, chili sauce, cucumber slices and coriander leaves impart a fresh texture and irresistible flavor to this dish. A noodle dish served in curry, blends boiled chicken, cockles, tofu and bean sprouts for a surprisingly good treat. A type of meat dish preparation which takes hours to prepare. Meat, coconut milk, chilies onions and spices such as cinnamon, cloves, coriander and nutmeg are cooked over low heat. The result is a moist, tender dish with subtle and complex flavors. 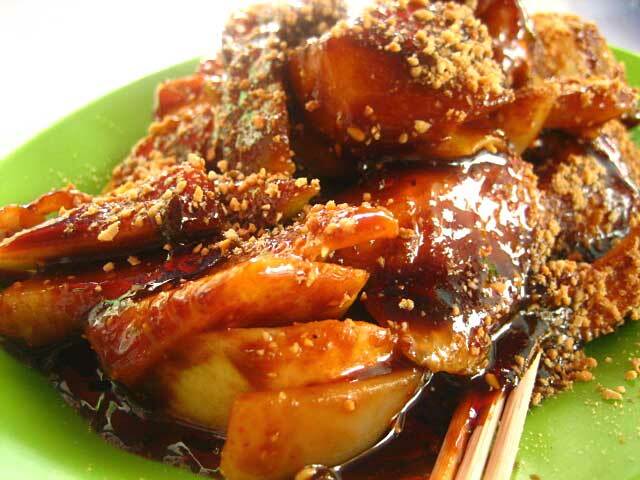 Eaten with rice ketupat (rice cake) or lemang (glutinous rice cooked in coconut milk). An in-house dish. Diners sit round a table which has a soup tureen in the middle of the table. A fire below keeps it boiling hot. One then places prepared raw pieces of prawns, chicken, quails’ eggs, sea cucumber and liver in the boiling soup. Tantalizing meat-free dishes can be found in Buddhist vegetarian restaurants or in South Indian banana-leaf restaurants. Instead of plates and cutlery, you will be served your food on a banana leaf; try to use your hand to eat! This is one of Malaysian speciali-tea, which is made from tea and sweet condensed milk. ‘Teh tarik’ literally means ‘Pull-tea’. What happens is the ‘mamak’, who makes the ‘teh-tarik’, will prepare the tea. Before serving the customer, he will hold one glass of ‘teh tarik’ up and another empty glass at the bottom. Then he will pour the tea from one glass to another for few times until it makes some bubbles. I think it also makes the hot tea cool down for a bit before we have it, and blend the ingredients. Click here to see how the ‘mamak’ makes the ‘teh tarik’. You can also see the ‘mamak’! *’Mamak’ is a term the Malaysian people call the Indian Muslim man, usually when we go to the Roti Canai or Teh Tarik stall. this time Lat cartoon is about Tun Dr. Mahathir Mohamed, Malaysian 4th Prime Minister. If you interested to know about Malaysian economic, technologies, sciences and political, this is the book. Just a brief stories, but full of fun, as always.